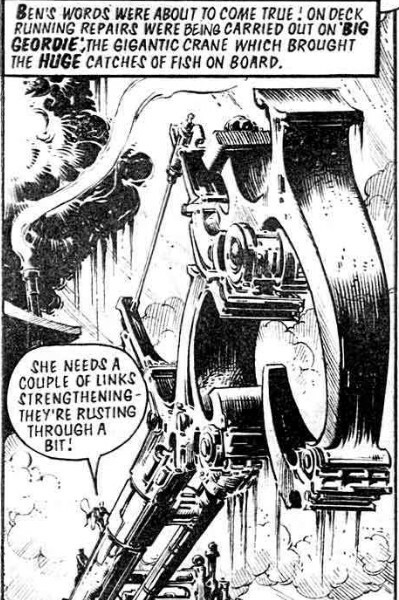 This is an ongoing series of blog posts where I am reading comic books from the far distant past, specifically early 1979, and in this post I am looking at issue 94 of 2000 AD. The cover of this issue is, for me, a classic. It shows one of the stories within, an epic story arc of the Judge Dredd strip called The Day the Law Died. It’s drawn by a very talented artist called Mike McMahon. McMahon was the character's most regular artist at this time. Other artists, such as Brian Bolland, followed his lead, putting their own spin on the way McMahon was developing the character and his world. This is a good example of McMahon's early work, characterized by a quick, spontaneous approach that verges on the messy. The crazy guy on the cover is a character called Chief Judge Cal, who is at the head of a future government that was already an already authoritarian regime, as it descends further into the madness of despotism. It has been doing a great job of it, so much so that I constantly find myself comparing it to the USA of Homeland Security, the NRA, and the NSA, as it goes full Trump. But this issue something changes, and what had been a claustrophobic investigation of a repressive government, suddenly gets opened out. We see a squad of mercenaries added into the mixture. 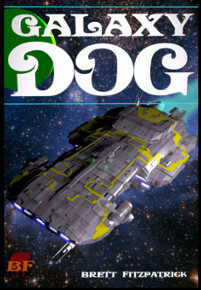 Not just any alien mercenaries, mind you, huge brutes that look like crocodiles. 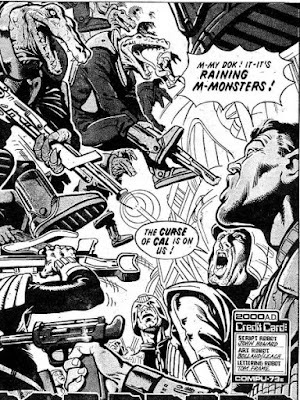 The interior art for the Judge Dredd strip this issue isn’t by McMahon, instead it is drawn by Brian Bolland. 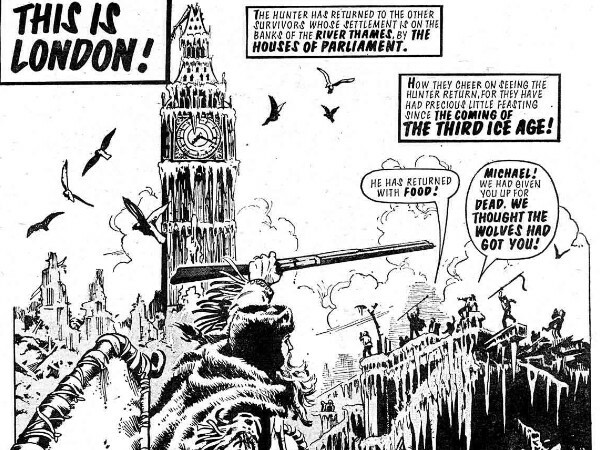 Bolland has become the more famous of the two artists. He spearheaded the move of UK talent to the American comics industry. 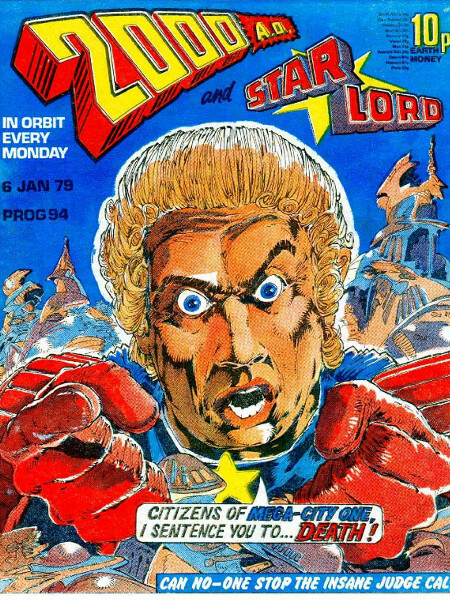 Bolland remains in high demand as a cover artist, producing the vast majority of his work for DC Comics. I have always found his work to be breathtakingly disciplined, but static and lacking in background detail. McMahon was always my favorite Dredd artists, and one of my favorite artists, period. 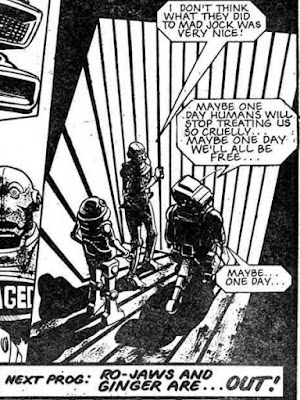 I remember at the time being surprised by the arrival of alien mercenaries, because nothing in the previous Judge Dredd strips I had read had hinted that the world of Mega-City One had made contact with aliens. 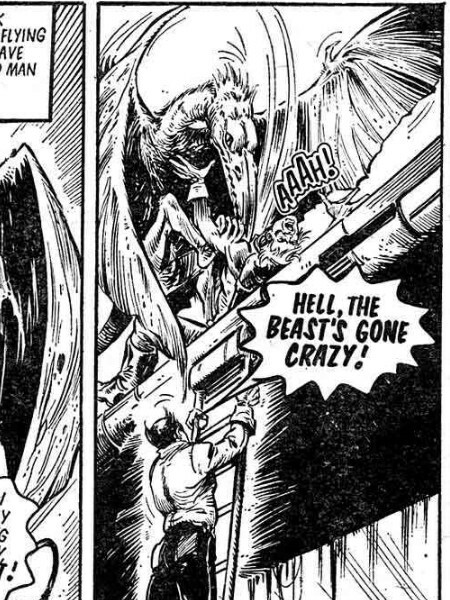 The aliens are paid in meat, and Cal has - according to the comic - had the alien spaceship parked in orbit just in case the population rose up in revolt. It’s a crazy plot twist, and to me it doesn’t feel like Judge Dredd. I can’t deny that it is a lot of fun, though. Cal is his usual crazy dictator self, and that part of this weeks installment is the most enjoyable. I’m also struck by how many of Trump’s characteristics Cal shares. He has crazy hair, weird eyes and no grasp on reality whatsoever. At the end of the episode, he sentences his own city to death, in its entirety. We’ll have to wait till next week though to she how that turns out. Next up is Ro-Busters, and Mike Dorey is doing the art again. He uses a lot of ink to create dark and grim imagery that suits this story particularly well. Ro-Jaws, the droid hero of this story, is in robot prison, an unlikely concept, but let’s go with it, and there is a confrontational atmosphere with the human guards. The robots call the guards meatball while the guards counter by calling the robots, grease pot. It’s future slang and it’s fun and inventive. 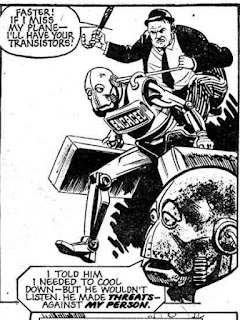 The comic also introduces the concept of a minicab robot, a humanoid droid which people ride on the back of. We see a fat man, in the stereotypical 1970s clothes of a banker, riding on the back of the droid, a very effective metaphor for the thoughtless subjugation of other people by the rich. The story also presents a cell 101 within the prison that is used to break rebellious robots. This is obviously based in George Orwell’s room 101, and makes this quite a cerebral installment of Ro-Busters, considering the strip this week is given over to the reminiscences of a garbage droid. The next strip up is Flesh, a strip about humanity going back in time to the Triassic to catch prehistoric fish on an industrial scale. Entertainingly, this week we get an advertisement in some kind of hologram viewer featuring a handsome fisherman, then we cut to reality, with a surly brute piping liquefied fish parts into a tanker. We get to see the management style of the future too, which includes the cat-o-nine-tails for minor infractions. I’m sure most companies today would be quite happy to introduce such a system, if it was legal: it would certainly increase productivity. The workers do sixteen hour shifts without a break, which is already happening in places western regulations don’t reach, so another accurate prediction from this silly old comic. 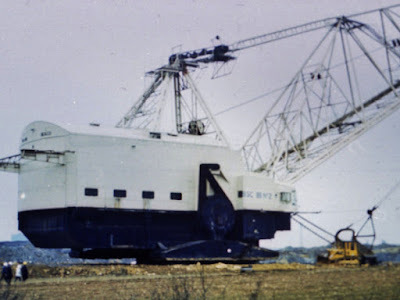 I noticed that the fish farmers of the Triassic sea have a crane called Big Geordie, which is a name taken from a real crane of the 1970s that was quite famous in the UK. It looks very different of course, thanks to Belardinelli and his shaky grasp on engineering and his real-world structures should be put together, if you don’t want them to fall down. The point of Flesh isn’t to satirize labor relations however, as a strip it is about bloodthirsty cruelty, and we get a nice dose every week. This week an unlucky welder working on the giant crane gets his guts pecked out by a pterosaur. It’s a very detailed one with protofeathers. There is a Future Shock next, written by Mike Cruden, and it’s quite an effective one because Mike and the team make no bones about trying their best to set up a twist ending, then they nail it, and they’re so proud of themselves when it comes together that it’s infectious. The next story is Strontium Dog about a future bounty hunter called Johnny Alpha, and there is more ridiculousness this week, as Johnny and his sidekick find themselves trapped on a planet that is about to blow up, because of a bomb they just planted. The while plot, as I mentioned when I blogged about this story arc last time, is genocidal and flies in the face of any laws of physics. I actually groaned in annoyance when Johnny’s sidekick, Wulf, got his foot caught in a grate. It’s a pretty cheap way to introduce tension, and par for the course for this story arc. Despite that, this is a classic issue of 2000 AD, and well worth a read.